Si fuiste uno de los Afortunados en recibir una invitacion de Google Wave, pues aca como twittear desde ahi. 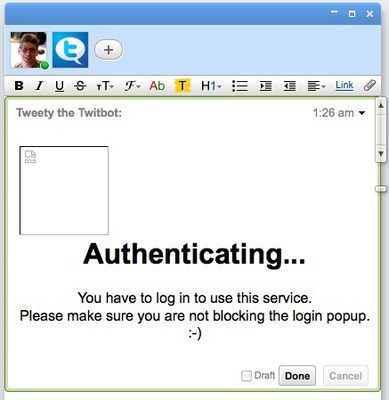 The only Twitter client I know of is called Tweety the Twitbot. 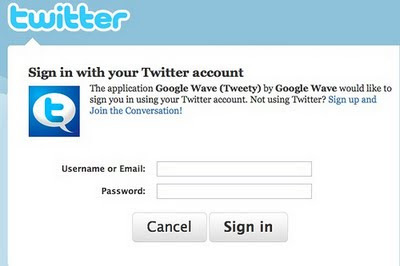 Today, I’ve also seen it called Twave, though the application itself still doesn’t seem to use that name. 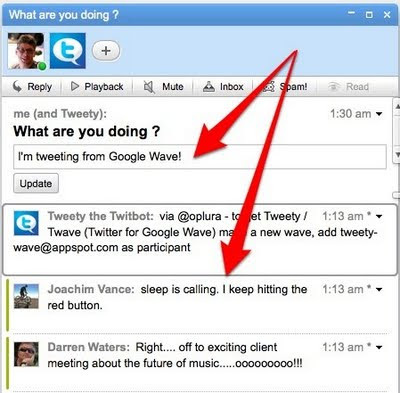 I used Tweety in the Google Wave sandbox preview and completely forgot how I added it back then. So I did some searching and came across a tweet from @oplura explaining that getting Tweety going is as easy as adding a contact. So let’s do it, with pictures. After you sign in successfully, you’ll get a message confirming this, and then the window will close. Enter your tweet into the top box (first arrow in the screenshot) and push update to send. Keep in mind that it won’t count down the 140 characters. If you go long, it won’t warn you. Below the tweet box, you’ll see tweets from others (second, lower arrow in the screenshot). You might try reloading the page, if it looks like the names of those tweeting aren’t showing up correctly. After that, well, I find that the box doesn’t seem to update. Maybe that will improve as Wave stabilizes during the current round of invites or as the app improves or who knows?